I dragged and drop some PSD files into a project in Illustrator CS5. I want to remove them from my desktop, but if I do that, then they will disappear from my project. What can I do in my project now (already opened with these files), to copy all current PSDs from desktop so I can delete them from my desktop ? What you are trying to do is to embed the file to your project, rather than linking it. 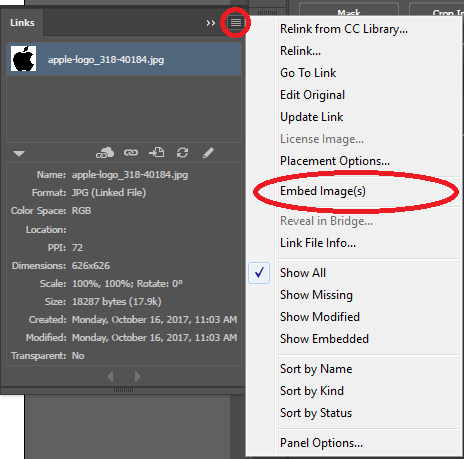 Selecting the file in the Links panel (Window→Links), and choosing Embed Image from the dropdown menu. Note, that embedding the images can (and most likely significantly) increase your artwork size. Not the answer you're looking for? Browse other questions tagged adobe-illustrator embedded file-placing or ask your own question. Should files made in Illustrator CS5 be updated to CS6? Why do Illustrator files end up larger than InDesign files?